Draft: 2008, Atlanta Braves, 10th rd. James Allen Hoover...Graduated from Elizabeth Forward (PA) High School and attended Calhoun (AL) Community College...Met his wife, Megan-Kate, in 2012 at the Cincinnati Zoo, where she worked as an animal trainer.....The couple now owns a farm in Batavia, OH called Son Rise Meadows..... Megan-Kate works on the farm and also trains animals for movies. Appeared in two games for Milwaukee and one game for Triple-A Colorado Springs before being released in April...Did not play the rest of the 2018 season. Signed as a free agent with Milwaukee on 1/10/18.Signed as a free agent with Arizona on 1/9...On the 10-day disabled list from 6/23-7/15 with right shoulder inflammation. Was the Reds' nominee for the Roberto Clemente Award...made 67 apps, 1 shy of staff leader Burke Badenhop and 2 shy of his 2013 career high...for the third time in his 4 Major League seasons posted an ERA below 3.00...in 54 apps from 4/24-8/31 posted an ERA of 1.05 (51.1ip, 29h), the second-lowest of any Major League pitcher over that 4-month span (Pit's Mark Melancon, 0.95era in 56g)...that stretch included a 30-appearance streak from 4/24-6/27 in which he didn't allow an earned run (28.2ip, 2r) and a season-high 16-appearance scoreless streak from 5/29-6/27 (15.2ip)...is the first pitcher in modern Reds history to follow a 10-game losing streak (all in 2014) with a 7-game winning streak (all in 2015)...that 7-game winning streak was snapped by his 8-6 loss on 9/5 vs Mil...was the longest winning streak by a Reds pitcher all season...in the 5-2 win on 6/24 at Pit earned his only save of the season...from 9/2-9/6 allowed a homer in 3 straight apps for the first time in his career (Kris Bryant, Elian Herrera, Ryan Braun)...in the top of the eighth inning on 9/11 vs StL threw 5 pitches before the game was delayed and eventually suspended, then returned to the mound the next afternoon to "start" the suspended game...earned that 4-2 win when Adam Duvall snapped the tie with a 2-run HR off Jonathan Broxton...for the third straight season was on the Reds' Opening Day roster...in his season debut on 4/8 vs Pit earned the 11-inning, 5-4 win to snap his 10-game losing streak, the longest in Reds history by a reliever...retired 44-67 first batters faced, stranded 9-12 inherited runners and converted 1-7 save opps. Made the Opening Day roster for the second straight year...established a career high in strikeouts...began the season with the Reds and went 1-10, 5.27 in 46 apps before he was optioned on 8/21 to Louisville, his first minor league stint since 2012...returned to Cin on 9/2 as 1 of 10 September callups and posted a 2.25era in 8 more apps...his 10 losses tie for the most in history by a Reds reliever for a single season (Harry Gumbert, 10-10 in 1947; Tom Hume, 9-10 in 1980)...in his season debut earned the Reds' first victory of the year in their second game (1-0 on 4/2 vs StL), then lost his last 10 decisions...his 10-game losing streak is the longest in Reds history by a reliever...the previous record for consecutive losses by a Reds reliever was 6, shared by Frank Smith (1954), Tom Hume (1980) and Rob Murphy (1988)...with a 1-10 record became only the second Reds pitcher since 1882 to finish a season with at least 10 losses and fewer than 2 wins (Jim Merritt, 1-11, 1971)...on 7/8 vs Cubs retired all 6 batters by strikeout, a career high for strikeouts in a game and the most by a Reds reliever in a game all season...following a 75-minute rain delay during an 11-4 win on 6/18 at Pit threw a career-high 2.2 innings, made his first career plate appearance (drew a walk off OF Travis Snider) and scored a run. Made his first Opening Day roster...led the pitching staff in apps...lost his first 5 decisions and won his last 5 decisions...as the Reds battled for a playoff spot posted a 1.69era in his last 14 apps of the season...converted 3-5 save opps...from 6/13-8/19 threw 26.1 scoreless innings over 23 apps, career-high streaks snapped on 8/20 vs Ari when he allowed a grand slam to Paul Goldschmidt...the 23-game scoreless stretch is a franchise record for a righthander...by both innings and games were the longest active streaks in the Major Leagues when snapped...in the 10-inning, 11-4 loss vs StL on 6/9 allowed a career-high 6 runs in 0.2ip...his season ERA in his other 68 apps was 2.07...produced his 3 saves on 5/3 at Chi, 5/5 at Chi and 5/6 at Mia...pitched in the fourth inning of the 6-2 Wild Card playoff loss at Pit, retired his only 2 batters. On 4/1 was acquired from the Braves for IF Juan Francisco...received the Mary E. Barney Award as Louisville's Most Valuable Player and was a Baseball America Class AAA All-Star...in his Major League debut posted a sterling 2.05era in 28 apps during 2 stints with the Reds (4/24-6/21, 8/23-end of season)...from 4/24-6/21, while Bill Bray was on the disabled list, posted a 3.00era in 17 apps...returned on 8/23, when C Devin Mesoraco was optioned to Louisville following a 2-game suspension, and finished the season by posting a 0.71era for the Reds over his last 11 apps (12.2ip, 1er)...in each of consecutive apps on 6/2 at Hou and 6/5 vs Pit allowed a season-high 2 runs (2.2ip)...in his other 26 apps of the season posted a 0.96era...allowed only 2hr, both on 6/5 vs Pit (Alex Presley, Casey McGehee)...in the 4-2 win on 4/25 vs SF made his first career appearance with a scoreless sixth inning...recorded his first career strikeout in his second appearance, on 4/27 vs Hou (Wandy Rodriguez)...on 5/26 vs Col earned his first career victory...in the 2-1 win on 9/12 vs Pit converted his first career save opportunity...pitched in Games 2 and 4 of the Division Series vs SF and threw 2.2 hitless innings. In 14 starts and 29 relief apps at Class AAA Gwinnett and Class AA Mississippi combined to finish 3-6, 2.64 with 2 saves...did not allow a run in 26 of his 29 relief apps while posting a 0.82 bullpen ERA...made his first appearance of the season in relief, then made all 14 starts before returning to the bullpen on 6/24 for the rest of the season...pitched for the Surprise Saguaros in the prestigious Arizona Fall League (11g, 2-1, 8.03)...was added to the Braves' 40-man roster on 11/16. At Class A Myrtle Beach and Class AA Mississippi combined to finish 14-7, 3.29 in 28 apps, all starts...was a Carolina League mid-season All-Star and twice won CL Pitcher of the Week Awards (6/1, 8/23)...led all Braves minor league pitchers in victories and ranked among the organizational leaders in innings pitched (4th, 153.1), strikeouts (3rd, 152) and ERA (4th, 3.29)...ranked second in the Carolina League in both wins (11) and strikeouts (118)...at Myrtle Beach was the organization's Pitcher of the Month for July (5-0, 1.22). In 19 starts and 7 relief apps at Class A Myrtle Beach and Rome led all Braves farmhands with 150 strikeouts, T14th-best among all minor league pitchers...also ranked among the organization's leaders in starter's ERA (6th, 3.47) and in innings pitched (8th, 137.1)...was a South Atlantic League All-Star, Class A Rome's Pitcher of the Month for June (1-1, 2.88) and August (3-1, 2.01) and Rome's Pitcher of the Year. April 2, 2019 RHP J.J. Hoover assigned to Fresno Grizzlies. 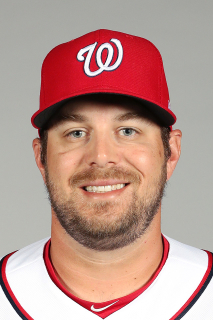 February 12, 2019 Washington Nationals signed free agent RHP J.J. Hoover to a minor league contract and invited him to spring training. April 16, 2018 RHP J.J. Hoover elected free agency. April 14, 2018 Milwaukee Brewers sent RHP J.J. Hoover outright to Colorado Springs Sky Sox. April 11, 2018 Milwaukee Brewers designated RHP J.J. Hoover for assignment. April 7, 2018 Milwaukee Brewers recalled RHP J.J. Hoover from Colorado Springs Sky Sox. January 19, 2018 RHP J.J. Hoover assigned to Colorado Springs Sky Sox. January 10, 2018 Milwaukee Brewers signed free agent RHP J.J. Hoover to a minor league contract and invited him to spring training. December 1, 2017 RHP J.J. Hoover elected free agency. October 4, 2017 Arizona Diamondbacks reassigned RHP J.J. Hoover to the minor leagues. September 1, 2017 Arizona Diamondbacks recalled RHP J.J. Hoover from Reno Aces. August 20, 2017 Arizona Diamondbacks optioned RHP J.J. Hoover to Reno Aces. August 14, 2017 Arizona Diamondbacks recalled J.J. Hoover from Reno Aces. July 26, 2017 Arizona Diamondbacks optioned RHP J.J. Hoover to Reno Aces. July 16, 2017 J.J. Hoover roster status changed by Arizona Diamondbacks. July 16, 2017 Arizona Diamondbacks activated RHP J.J. Hoover from the 10-day disabled list. July 13, 2017 Arizona Diamondbacks sent RHP J.J. Hoover on a rehab assignment to Kane County Cougars. July 5, 2017 Arizona Diamondbacks sent RHP J.J. Hoover on a rehab assignment to AZL D-backs. June 23, 2017 Arizona Diamondbacks placed RHP J.J. Hoover on the 10-day disabled list. Right shoulder inflammation. March 31, 2017 Arizona Diamondbacks selected the contract of RHP J.J. Hoover from Reno Aces. January 14, 2017 RHP J.J. Hoover assigned to Reno Aces. January 10, 2017 Arizona Diamondbacks signed free agent RHP J.J. Hoover to a minor league contract and invited him to spring training. October 12, 2016 RHP J.J. Hoover elected free agency. August 4, 2016 Cincinnati Reds sent J.J. Hoover outright to Louisville Bats. June 29, 2016 Cincinnati Reds optioned RHP J.J. Hoover to Louisville Bats. June 14, 2016 Cincinnati Reds recalled J.J. Hoover from Louisville Bats. May 7, 2016 Cincinnati Reds optioned RHP J.J. Hoover to Louisville Bats. September 2, 2014 Cincinnati Reds recalled J.J. Hoover from Louisville Bats. August 21, 2014 Cincinnati Reds optioned RHP J.J. Hoover to Louisville Bats. August 23, 2012 Cincinnati Reds recalled J.J. Hoover from Louisville Bats. June 22, 2012 Cincinnati Reds optioned J.J. Hoover to Louisville Bats. April 24, 2012 Cincinnati Reds recalled J.J. Hoover from Louisville Bats. April 1, 2012 Cincinnati Reds traded 3B Juan Francisco to Atlanta Braves for RHP J.J. Hoover. April 1, 2012 Cincinnati Reds optioned J.J. Hoover to Louisville Bats. March 19, 2012 Atlanta Braves optioned J.J. Hoover to Gwinnett Braves. November 16, 2011 Atlanta Braves selected the contract of J.J. Hoover from Gwinnett Braves. August 9, 2011 J.J. Hoover assigned to Gwinnett Braves from Mississippi Braves. May 25, 2011 J.J. Hoover assigned to Mississippi Braves from Gwinnett Braves. May 17, 2011 J.J. Hoover assigned to Gwinnett Braves from Mississippi Braves. August 17, 2010 J.J. Hoover assigned to Mississippi Braves from Myrtle Beach Pelicans. April 3, 2010 J.J. Hoover assigned to Myrtle Beach Pelicans from Rome Braves. July 29, 2009 RHP J.J. Hoover assigned to Rome Braves from Danville Braves. July 25, 2009 J.J. Hoover assigned to Danville Braves from Rome Braves. April 18, 2009 J.J. Hoover assigned to Rome Braves from Myrtle Beach Pelicans. April 17, 2009 RHP J.J. Hoover assigned to Myrtle Beach Pelicans from Rome Braves.